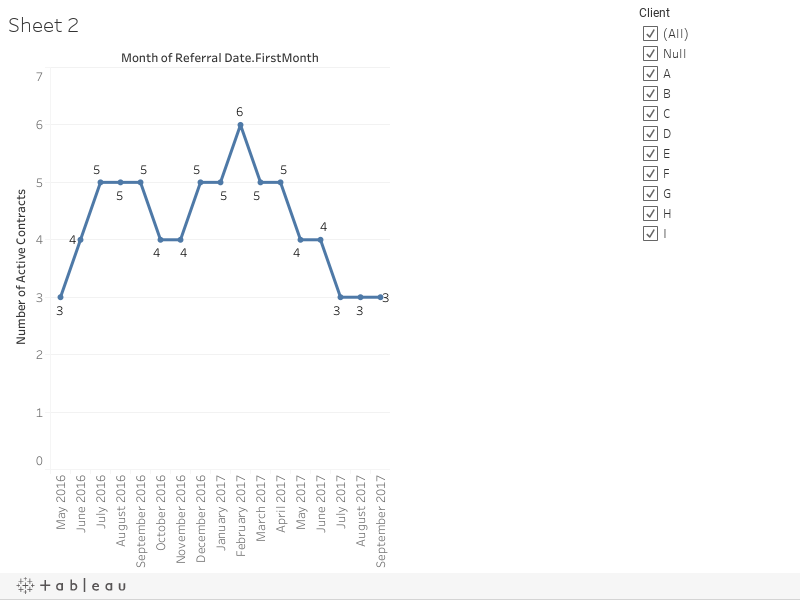 Is it possible to incorporate data reshaping into the Tableau Extract Engine? The list below is sorted by date, that is, not by relevance or quality. 2017-08-02 How to get names of months between two dates? 2017-07-31 how many employees are working by the hour of the day. 2017-07-10 Filling in the missing dates - "This works perfectly!" 2017-06-28 How to display a daily number of guests based on the start and end dates of their stays ... ? 2017-06-19 How to synchronize 2 date fields and filter independently? 2017-05-01 How to calculate an exact date with period # and start/end dates? 2016-11-18 How to aggregate ticket/inventory management in tableau ? 2016-02-08 How to combine 2 different charts? 2015-11-24 Inventory Levels - Issues With Timeline. 2015-11-17 Use time parameter in time series? 2015-11-03 How to create a table calculation to understand the evolution of a workforce in a career? 2015-11-02 how to create a burn down chart? 2015-08-18 Help getting a value for every day (date) of the month. 2015-08-18 How do I count cases matching a calculation over time? 2015-08-13 Reporting of dates within dates - i'm confused..
2015-08-05 How can I partition revenue over a date range such that it falls equally (or at percentages I want) on each day? 2015-07-29 Trying to replicate Excel Countif statements and having a hard time. 2015-07-28 How to calculate net new using open and closed dates? 2015-06-29 How do I show estimated revenue over time with only a campaign start date and end date? 2015-06-29 Series chart with only start and stop date. 2015-06-25 How to reference a column's value in a calculated field? 2015-05-10 Sum time intervals on a date placed over multiple rows i data? 2015-04-30 Is it possible to create psedo months and divide value between them ? 2015-04-14 How do I show two date ranges in one Viz? 2014-12-30 How can I create a calculated field that will count rows where a date is missing? 2014-12-02 Charting motor runtimes from timestamps? 2014-11-13 How do I create hourly time buckets to graph two different time-related fields on the same axis? 2014-06-30 How do I make a "trailing date range" calculated field? 2014-04-07 Custom filter with multiple conditions including list? 2014-03-20 How can I link Date subtotals from the same table? 2014-03-04 How can I link idenical matters in snap shot data? 2014-02-06 How do I generate multiple values from a single data point? 2013-12-12 Count 'active' people in a Gantt chart? 2013-11-05 Multiple Measures on an Independent Date? 2013-10-16 How do you create a cumulative employee turnover trend chart using only a start-date and end-date? 2013-10-09 Using a date parameter as a column? 2013-09-27 Why can't I convert my date dimension to a measure? 2013-08-28 The specified item was not found. 2013-07-02 Hi, I am looking to track open and closed cases across a period of time. 2013-03-04 Hourly/Daily instrument utilization using status dates. 2013-02-17 How do I create a Date field to show a timeline of events? 2012-10-19 Finding entries that were not present in a previous period? 2012-08-23 Trying to get a total of all items between two dates using two date measures. 2012-02-23 How to count ID #'s within a date range by date? 2011-01-14 Is there a way to re-order the columns in a set? 2008-08-23 Syntax for co-ordinates in a table? 1. The primary aim of this question collection is to show that issues with open and close dates (and alike) is an almost overwhelmingly frequently asked question. Why so would be interesting to know, but not something I will try to answer, at least not now, although I hope to hear some opinions on why it is so and what to do about it. 2. A secondary aim is to encourage production of well-written teaching materials, videos, and a workbook with all the examples which self-learners can study on their own. such a frequently asked question - thank you. Provided a couple of solutions to the problem. Thanks. Hereby added under the Blogs section. I couldn't find anything similar online. Re: in which month from the set date there was a sale?